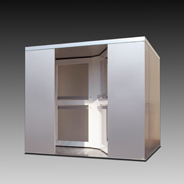 The fully operational entry is designed to meet the unique demands of an air supported structure. The design allows for the highest volume of traffic with minimal air loss. The three leaf configuration provides ample walking area even while equipment is being carried. 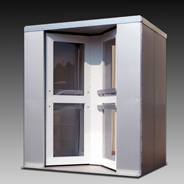 The fully operational entry is designed to meet the unique demands of an air supported structure. The design allows for the highest volume of traffic with minimal air loss. The four leaf configuration provides easy access. The materials and finishes used in the door result in durability and an appearance that is aesthetically appealing.